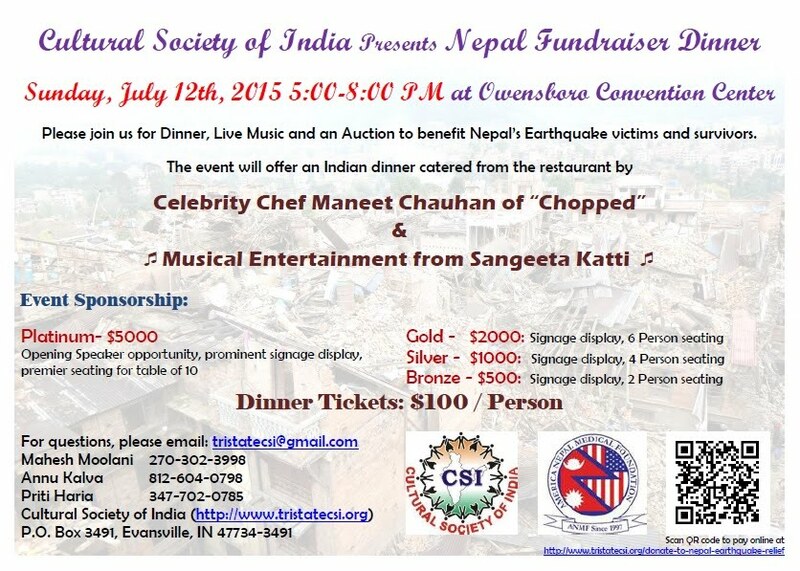 The Tri-State Cultural Society of India, a tri-state community, which represents more than 300 Indian origin families in Owensboro, Evansville and the surrounding area, is conducting a fundraising dinner with 100% of proceeds going to America Nepal Medical Foundation (http://americanepalmedicalfoundation.com/) to provide direct aid to the people of Nepal. The event will be held on July 12 at the Owensboro Convention Center. The event will offer an Indian dinner catered from the restaurant of celebrity chef Maneet Chauhan of “Chopped” and musical entertainment from Sangeeta Katti ( www.sangeetakatti.com ) along with silent and live auctions. The goal is to raise $50,000 to provide the victims with medical care, food, and other life essentials. Entrance for the event will be $100 per person, or $1000 per table of 10 guests. Your support of this event will help thousands of people who have been devastated by these earthquakes. The Tri-State Cultural Society of India is expecting an attendance of 400-500 people at the event. We need your help with sponsorship. There are 4 levels of sponsorship: Platinum Sponsor, Gold Sponsor, Silver Sponsor, and Bronze Sponsor.